http://www.JewishWorldReview.com | Have you ever asked yourself why, despite more than 10 years of effort - involving, among other things, the loss of thousands of lives in wars in Iraq and Afghanistan, well over $1 trillion spent, countless man-years wasted waiting in airport security lines and endless efforts to ensure that no offense is given to seemingly permanently aggrieved Muslim activists - we are no closer to victory in the "war on terrorism" than we were on Sept. 11, 2001? In an effort to provide the missing answer, on Tuesday , the Center for Security Policy is making available via the Internet a new, free 10-part video course titled "The Muslim Brotherhood in America: The Enemy Within" (MuslimBrotherhoodinAmerica.com). This course connects the proverbial dots, drawing on a wealth of publicly available data and firsthand accounts to present a picture that has, for more than a decade, been obscured, denied and suppressed. In addition to the threat of violent jihad, America faces another, even more toxic danger - a stealthy and pre-violent form of warfare aimed at destroying our constitutional form of democratic government and free society. The Muslim Brotherhood is the prime mover behind this seditious campaign, which it calls "civilization jihad." The Muslim Brotherhood? Yes, that would be the same organization to which President Obama recently transferred $1.5 billion of our tax dollars in a lump-sum payment. For him to do so, Secretary of State Hillary Rodham Clinton had to waive congressionally imposed restrictions born of fully justified concerns about the nature and direction of the Shariah-adherent government the Brotherhood is birthing in Egypt. Mrs. Clinton's presidentially directed waiver came despite the following: the Brotherhood-dominated government's hostage-taking of American democracy activists; murderous Islamist rampages against Coptic Christians and other religious minorities; the toleration and abetting of escalating violence against Israel in and from the Sinai; and official threats to jettison the 1979 peace treaty with the Jewish state. Matters have only gotten worse since the president's largesse was made available in an unusual upfront lump-sum payment. Unfortunately, as the center's course makes clear, this episode is just the latest of many that flow from the subversion by Muslim Brotherhood operatives that has been happening within our civil society and governing institutions in every administration since Bill Clinton was in office. During his presidency, a top Muslim Brother, Abdurahman Alamoudi, was put in charge of recruiting, training and credentialing Muslim chaplains for the U.S. military and prison system. Incredibly, some of them are believed to be in place still, even though Alamoudi turns out to have been a top al Qaeda financier and is doing hard time at Colorado's Supermax on terrorism charges. The George W. Bush administration similarly was subjected to Muslim Brotherhood penetration and influence operations. As the course documents, the Brothers' access to and influence with senior officials in the years after Sept. 11 helped shape policies that, among other things, induced the federal government to use euphemisms like "terror" to describe our jihadist enemy; reach out to the Muslim community in this country using virtually exclusively Brotherhood front organizations as liaisons; and provide support to and participation in Shariah-compliant finance - an industry engaged in what one of its leaders, Sheik Yusuf al-Qaradawi, calls "jihad with money." Unfortunately, those look like the good old days compared to what is happening under the Obama administration. Mr. Obama facilitated and now has underwritten the Muslim Brotherhood's takeover in Egypt and an increasing number of states elsewhere in the Middle East. At his direction, explicit or implicit, the U.S. government is systematically purging its training materials of any information that Islamists might find offensive - including factual information about Shariah, its impelling of jihad (preferably violent and, where necessary, pre-violent) and the Muslim Brotherhood's mission of destroying us from within. Worse yet, under Team Obama, Brotherhood operatives doing business as Muslim "community leaders" are being allowed to have a say in what sort of training and outreach is done from here on and by whom. Could we have won the Cold War if we had given a similar role to the KGB or the American Communist Party it ran? Or World War II if that role had been assigned to the German-American Bund? In short, we are losing what is more accurately described as the "jihadists' war on America" because we are being subjected to a systematic, disciplined and highly successful campaign of what the military would call "information dominance." It leaves us as a nation witless about the true nature of the enemy and his motivations and therefore incapable of countering them effectively. "Freedom is never more than one generation away from extinction. We didn't pass it to our children in the bloodstream. It must be fought for, protected and handed on for them to do the same, or one day we will spend our sunset years telling our children and our children's children what it was once like in the United States where men were free." JWR contributor Frank J. Gaffney, Jr., Deputy Assistant Secretary of Defense for Nuclear Forces and Arms Control Policy in the Reagan Administration, heads the Center for Security Policy. Comments by clicking here. 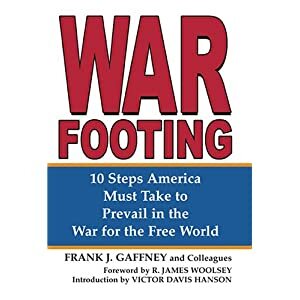 © 2006, Frank J. Gaffney, Jr.